If you’ve been watching this blog, then you know that last week we were practically bursting at the seams with excitement as we dropped the first of many upcoming announcements pertaining to this year’s rapidly approaching LA Film Festival. In addition to announcing the Festival’s Opening Night film, Ricardo de Montreuil’s Lowriders, we told you to our new home at the ArcLight Cinemas in Culver City and Hollywood, and announced two of this year’s Festival honorees: Guest Director Ryan Coogler and our 2016 Spirit of Independence Award winner Ava DuVernay, who will share the award with her distribution company, Array Releasing. In fact, this year’s LA Film Festival is already poised to be one of the most innovative and exciting cinema celebrations of 2016, with progressive programming picks and a warm, inclusive Festival community designed to wow audiences and launch the next generation of new filmmaking talent. But you don’t have to take our word for it. We caught up with Festival Director Stephanie Allain to find out what she’s excited to see, hear and experience at this year’s Festival, and take a peek behind the curtain at how it all comes together. LA Film Festival passes are now available for purchase to the general public—so don’t delay! Click here for more information. So what can we expect from the LA Film Festival this year? How will it be different than previous years? You can expect to see a light shined on artists who are uniquely diverse. It’s about having a platform for filmmakers who aren’t traditionally in the mainstream to have their say. And that’s women, that’s directors of color, that’s LGBT [filmmakers]—so this year you’ll see a lot of amazing movies from very authentic points of view. And this year the program is primarily premieres, correct? This year all of the competition films are world premieres. And that’s very, very unique. There were just too many great new filmmakers and new movies not to shine a light on them. And we have a new home at the ArcLight Cinemas in Culver City and Hollywood. I’m really excited…it’s going to be really fun and accessible to everybody. What are you personally most excited for, whether it’s a particular film or event? I’ll start with our opening night film, Lowriders. I love this film! It’s about East LA car culture and Mexican culture that’s so prominent in Southern California, so I’m very excited about that. I adore [Guest Director] Ryan Coogler. He’s not only one of our most talented young directors and a Spirit Award winner [in 2013 for Best First Feature for Fruitvale Station –ed.] but he’s also the nicest human being. With all of his success, he’s skyrocketing. So even though he’s going to be in prep on a film, he’s coming to the Festival. He’ll be there to interface with our audience and our filmmakers, and that’s exciting. You know, [honoree] Ava DuVernay has been a Film Independent Board Member, she’s been a Festival alum, she won a Spirit Award for Middle of Nowhere, she’s worked for our labs and she’s just been such a supporter [of the Festival]—our missions are so in sync. So Ava doesn’t need any more light shined on her. This is really about the women behind Array, Ava’s distribution company, who are working hard to find, identify and promote films that may not have ever gotten a theatrical release. That’s like taking our mission to the next level. So that’s why honoring her company with the Spirit of Independence Award is so, so right this year. Going back to Lowriders, what goes into selecting the Opening Night film? It’s a great question. In my mind, the Opening Night film should be a world premiere. We should be debuting a new voice to the world. And for [the LA Film Festival] specifically it’s also about identity and who we are, since we’re about shining a light on diverse filmmakers. Director Ricardo de Montreuil is a Peruvian filmmaker, and it’s amazing the way he’s gazing at East LA. There’s a lot of love there. So yeah, I’m looking for something that represents us. It’s interesting for Southern California—and especially for Los Angeles—where so much of our population is Latino, I don’t feel like we [as a culture] do enough to shine a light on what’s all around us. So Lowriders is particularly resonate, because it really hits all of the boxes we look for—and ultimately, it’s a really entertaining two hours in the dark with strangers! What were some of your biggest programming challenges this year? What’s the process like? This is the second year of having a new team in place, and we’ve been building on our motto, which is: if you want a diverse program, you have to have diverse programmers. Roya [Rastegar, LA Film Festival Programming Director] and Jennifer [Cochis, LA Film Festival Creative Director] have done such a great job of reaching out to really talented, highly qualified curators who donate so, so many months to watching hundreds of films and committing to sitting down each week for three months to discuss them. We’re really trying to make sure our entire program is weighted toward underrepresented filmmakers. The “best” is so subjective in terms of what matters to you, you know? It’s an emotional response—that’s the beauty of what we do. [Our programmers] bring themselves to the process and stand up for the things they really know and understand. So your mind just sort of gets opened up through the process of programming. That’s one of the give-backs of being a programmer. Tell me a little bit about this year’s Festival poster. This year we really wanted to pivot to a more female-centric style of poster, so Mary Sweeney (Film Independent Board Chair) and I looked at a lot—a lot—of artists. We also wanted something with Latin flavor. We just started meeting people, and we went to [poster artist] Carolyn Castaño’s studio. We loved her! It’s feminism in the best way, because she’s just so unabashedly concerned with typically feminine things like flowers and botanicals, but she really embraced the notion of a poster that celebrates power women behind the camera. And that’s really what we ended up with—it’s vibrant, it’s strong, it’s active and I’m just so excited that it’ll be up on billboards soon! Last question: what are your goals for this year’s LA Film Festival? My goals are to sell every single seat! [laughs] I think it’s doable! We have amazing films. And my goal always is for the filmmakers to have an experience that they’ll never forget. As we all know, Hollywood is very social. A lot of times you’ll just be sitting talking with someone and the next thing you know, you’re making a movie together. That’s how it works. The most important thing that we can do as the LA Film Festival is to identify the talent, and then connect the talent to the business. Because if a tree falls and there’s no one there,…? I want to make it as comfortable as possible. And the last thing is just allowing our audiences to have a firsthand look at the inner working of Hollywood, and at the workings of all these wonderful artists. 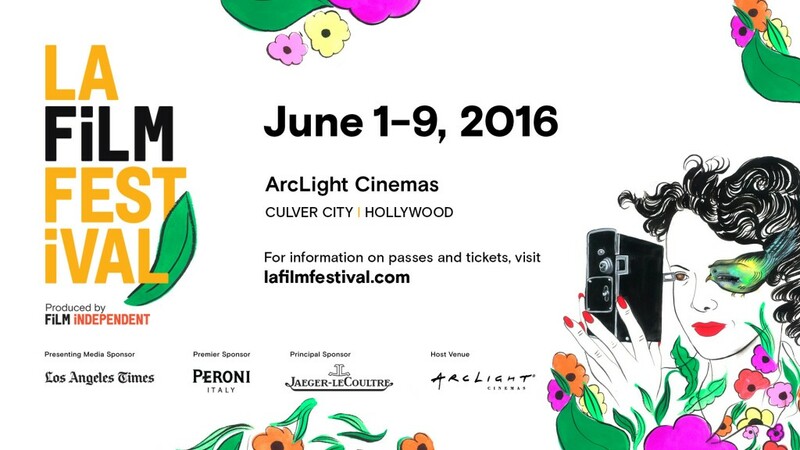 The 2016 LA Film Festival will take place June 1-9. For more info, please visit our website, stay tuned to this blog and subscribe to our YouTube channel. To learn how to become a Member of Film Independent, just click here. Come be a part of this year’s fun! Pass sales are now open to both Members and the general public. Click here to buy yours today! Individual tickets for Members go on sale Tuesday, May 5 and will be open to the general public Tuesday, May 10. Go on—log on and secure your spot at the 2016 LA Film Festival. We’ll keep a seat warm for you!